My recent Why, Richmond, Why?!? column in the Richmond Times-Dispatch dealt with “Cyclists, pedestrians & drivers still working on mutual respect,” a topic that I like to revisit on occasion to see how far the Richmond region has come to becoming more bike-friendly. I spoke with Max Hepp-Buchanan, the director for Bike Walk RVA, a regional program created by Sports Backers to support bike- and pedestrian-friendly infrastructure projects and help educate citizens on biking issues. I’m a cyclist and often write about cycling issues. I consider myself an advocate for bikes, but I certainly keep an open mind about biking infrastructure and cyclists behavior — the latter I often both criticize and defend. The column included 10 suggestions for cyclists and 10 suggestions for drivers, which did not appear in the newspaper, only online. The loudest bike voices in the city often are the strongest cyclists and the least likely to need new bike infrastructure, he said. These are the cyclists you see mixing in with traffic and riding confidently all over the city. Not every rider can do that and until Richmond can provide safer options, we won’t be a bike-friendly city. “What we want are more voices from the crowd who would bike if they had safer options. Getting more people to ride bikes more often for transportation is the right way to get more riders,” he said. I’m part of the loud bike voices. I’m also someone who rides most places without fear. I may not be someone who needs bike lanes, but there are many current riders and potential cyclists who may be more encouraged by safer routes and protected lanes. 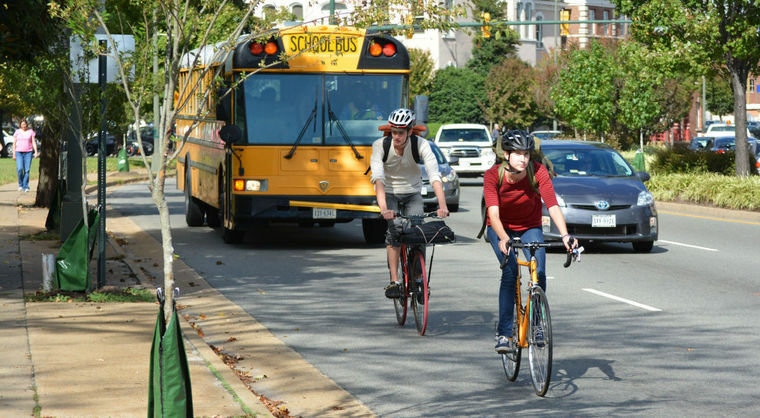 The column also brought many comments, as usually happens with cycling topics in Richmond. I did not fully address some of the more common misnomers that non-cyclists claim about biking, but found a great source from Bicycling magazine, which recently posted “The Best Responses to Anti-Cyclist Claims” to help cyclists. It was a fun read and matched many of the topics that I touched on, but in much more detail. “The next time an extremist offers reasons you shouldn’t be on the road, shut them down with irrefutable arguments,” the article touts of the five examples (each is explained in detail). Cyclists are a bunch of freeloaders who don’t pay to use the roads! Response: Road taxes don’t even pay for these roads. My property, income, and sales taxes do. Roads were built for cars, not bikes! Response: Bike access is a big reason why we even have paved roads—and it’s the law to maintain them for cyclists. Bikes should be registered with a tag, and cyclists should take a road test! Response: Cyclists already get ticketed regularly—and it’s barely worth traffic cops’ time. Cyclists are a bunch of scofflaws! Response: No more than anyone else—and you don’t like us when we follow the rules. All these Lance Armstrong-wannabes in their spandex are clogging up the roads! Response: Not any more than NASCAR-wannabes in their mom jeans with double-wide SUVs. Feel like funding some bike lanes? I used to cycle, but now motorcycle. The roads belong to us all, we are all just people trying to enjoy the fun between the goalposts. Fair article, and those that look down on bikes seem more likely seem jealous that they don’t experience life outside! The world is better outside of your car. Just not air conditioned!